+$The strange promoted statuses were part of a product relaunch. +$If you follow Carlsberg, or you've convinced Twitter's algorithm that you're the sort of person who could benefit from seeing statuses published by the Scandinavian lager, you might have seen some apparently bizarre promoted tweets recently. However, it turns out they're part of a cunning piece of publicity. 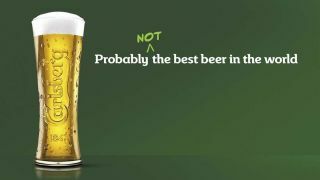 +$Carlsberg, which used to profess to being 'probably the best beer in the world', left Twitter users scratching their heads after it promoted statuses that actively laid into the brand. These included tweets that compared the lager to naan bread, and the taste of bath water your nan died in. Poetic. +$This wasn't, as some speculated, the actions of a social media manager riding out their last day in style. Instead, it was Carlsberg paving the way to the launch of a better beer. If this marketing strategy sounds familiar, it's because KFC already did something very similar when it launched its new recipe fries late last year. +$Taking a pot shot at yourself is quite a brave move for a brand, but it's a way of showing that it's listening to the complaints of its customers, such as those disgruntled tweeters. +$The ad sounds pretty sincere, and addresses some of the lager's shortcomings. "Somewhere along the line, we lost our way," the advert laments. "We focused on brewing quality, not quantity. We become one of the cheapest, not the best." +$To combat this, Carlsberg admitted that it needs to "create a better beer. A new Carlsberg, that’s been completely rebrewed from head to hop." Will Carlsberg live up to this aim? Its answer, of course, is 'probably', showing that even an apology can stay on brand.